Eastern sophomore Mason Dishong (center) shoots a jumper from the lane, during the first half of the Eagles’ 54-46 victory over Waterford on Friday in Tuppers Plains, Ohio. Eastern sophomore Garrett Barringer (30) shoots a layup in front of a pair of Wildcats, during the first half of the Eagles’ overtime victory over Waterford on Friday in Tuppers Plains, Ohio. TUPPERS PLAINS, Ohio — Any given Friday. 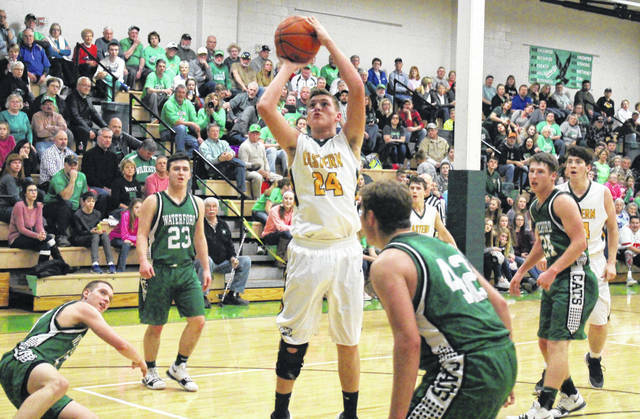 The Eastern boys basketball team — which sat at the bottom of the Tri-Valley Conference Hocking Division after suffering five straight setbacks in league play — defeated league-leading Waterford by a 54-46 count in overtime on Friday night at ‘The Nest’, ending the the Wildcats’ streak of six straight TVC Hocking wins. The Eagles (5-8, 2-7 TVC Hocking) led just once in regulation, at 2-0, with the Wildcats (7-4, 7-2) jumping out to an 11-5 lead by the end of the first quarter. By the midway point of the second quarter, Waterford’s lead grew to a game-high 11 points, at 22-11. In the final four minutes of the first half, Eastern held WHS to a single field goal and trimmed the deficit to six points, at 25-19, by halftime. The Eagle defense also held Waterford to a one field goal in the first four minutes of the second half, as the hosts moved to within one point, at 27-26. The teams traded baskets three times over the next four minutes and WHS clung to a 33-32 lead with eight minutes left in regulation. The Eagles tied the game with a free throw in the opening 30 seconds of the fourth quarter, but the Wildcats answered with a 7-2 run and led 40-35 with 5:00 to go. However, Waterford did not make another field goal in regulation. Eastern hit 5-of-10 free throws over a four minute span, tying the game at 40 with 54 seconds left. A pair of Travis Pottmeyer free throws gave WHS a 42-40 advantage with 38 seconds to play, and to add insult to injury, Pottmeyer made it to the line on EHS senior Kaleb Hill’s fifth foul. Waterford had a chance to seal the win from the line with 13 seconds left, but missed the front end of the one-and-one, and EHS junior Isaiah Fish grabbed the rebound. 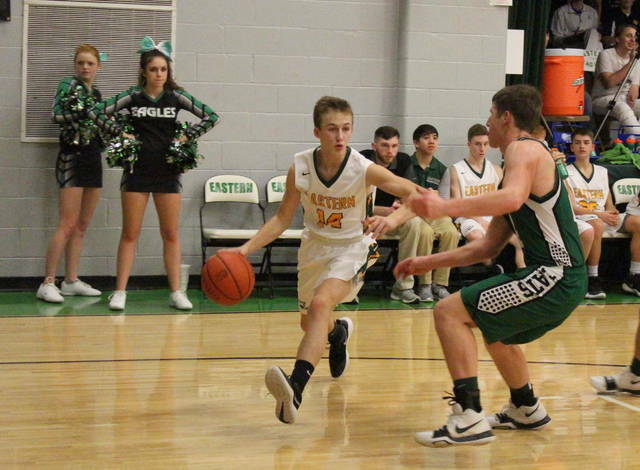 Eastern tied the game at 42 and forced overtime with just three seconds on the clock, as Garrett Barringer hit a jump shot on an assist from Blaise Facemyer. The Wildcats took a 44-42 lead in the first 10 seconds of overtime, but Fish tied the game with a two-pointer at the 3:15 mark. Fish gave the hosts a 45-44 lead 25 seconds later, hitting the first of 10 successful Eagle free throws in the extra session. Eastern extended its lead to seven points, before Waterford made its final basket with 27 seconds to play. EHS made 3-of-4 free throws in the final 25 seconds to cap off the 54-46 triumph. “This is a quality win for our team,” EHS head coach Jeremy Hill said. “Waterford has been the class act of the TVC for several years now, in all different sports. This is definitely the biggest win for the program since I’ve been here. For the game, Eastern shot 17-of-45 (37.8 percent) from the field, including 2-of-11 (18.2 percent) from three-point range. Meanwhile, Waterford shot 20-of-52 (38.5 percent) from field, including 3-of-14 (21.4 percent) from beyond the arc. 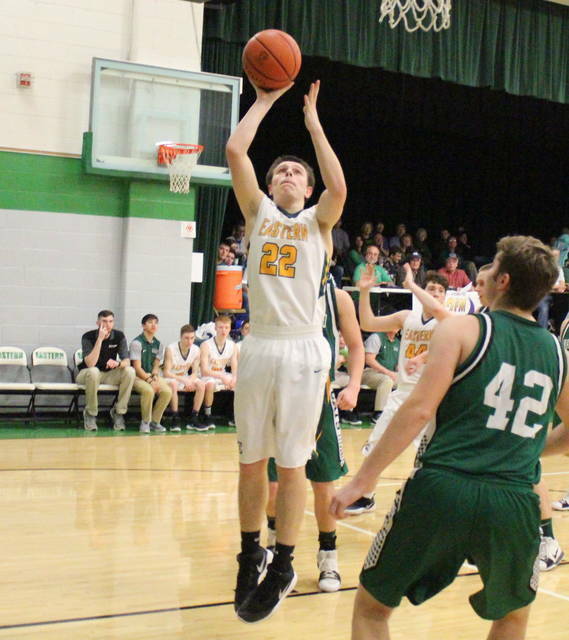 At the charity stripe, EHS shot 18-of-31 (58.1 percent), including 10-of-14 (71.4 percent) in overtime. The Wildcats were 3-of-7 (42.9 percent) from the foul line in the game. Eastern won the rebounding battle by a 34-to-27 count, including 10-to-9 on the offensive end. The Eagles committed 21 turnovers, two more than the guests, but EHS held a 14-to-11 advantage in steals. Both teams rejected two shots in the contest, while WHS picked up an 11-to-9 assists advantage. Barringer led the Eagle offense with 13 points, 11 of which came in the final 12 minutes. Fish and Kaleb Hill both scored 12 points, with Hill grabbing a team-best 10 rebounds and Fish pulling down seven boards. Sharp Facemyer and Colton Reynolds contributed six points apiece to the winning cause, Blaise Facemyer added three points, while Mason Dishong chipped in with two points. Barringer — who marked a team-best three assists — also led the EHS defense with three steals and one rejection. Reynolds, Blaise Facemyer and Sharp Facemyer came up with three steals apiece in the win. Pottmeyer led the Wildcats with 12 points, eight rebounds and four assists. 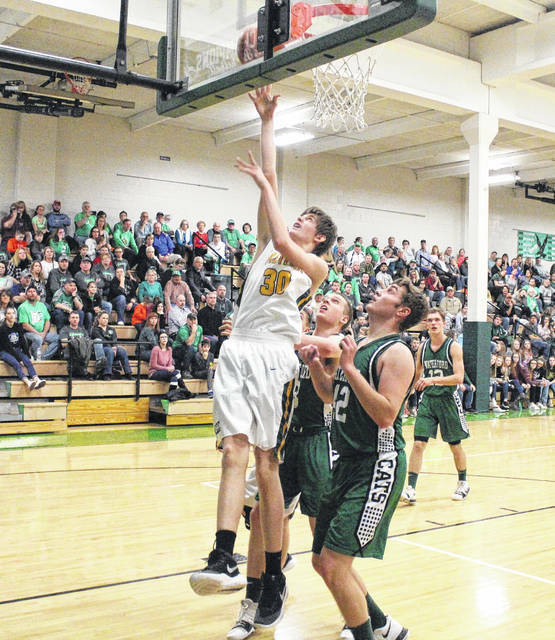 Bryce Hilverding scored nine points for WHS, Austin Pyatt recorded eight points and eight rebounds, while Noah Huffman came up with seven points. Peyton Stephens — who led the WHS defense with four steals and one block — had six points in the contest, while Russell Young scored four. The win also serves are revenge for the Eagles, who dropped a 60-42 decision at Waterford on Dec. 15. The Eagles are on the road next, as they visit South Gallia on Tuesday.